Take a moment and list everything you feel insecure about. 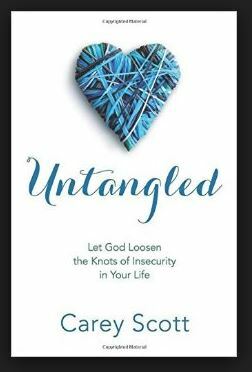 Carey Scott covers all these areas and more in her new book Untangled: Let God Loosen the Knots of Insecurity in Your Life. Chapter by chapter, Scott leaves no stone unturned as she addresses practically every area a women finds her self ensnared by shame and insecurity. I cannot think of a single topic she has not covered. With frank honesty, Scripture, and highlighting stories from women who have found freedom in untangling their own knots, Scott reveals how to overcome personal insecurities through Christ. She sheds a light on the lies women tend to believe of “not being good enough” and dismantles the feelings of shame. Scott’s words feel as though they are from a most trusted friend; gentle, honest and loving. As she reveals her own entanglements and shares how God untied those knots, she offers the same hope to each and every one of us. Each chapter ends with a suggested prayer and discussion questions. Untangled is a great book for personal study or a women’s group discussion. I’m pleased to offer a copy of Untangled to give to one lucky reader. To enter, please complete this form. A winner will be announced on July 6, 2015. I received a copy of Untangled for free in exchange for a review. I was not required to write a positive review.